So recently we talked about the All Terrain Bug Spray. This works great to prevent bug bites. But what if you already have bug bites? Bug bites are the worst! They itch all the time, can get big and red and even worse, can get infected!! They are unsightly and no matter how much we do not want to scratch them, we always end up scratching them. Well, my favorite product that I have found is Ssssting Stop. I came across this product, again through someones suggestion. I hated the cortisone creams and I was looking for something more natural. 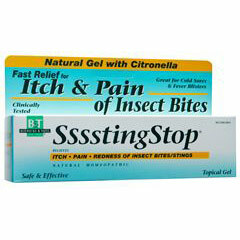 Sting Stop is a homeopathic formula that really works well! I put it on my bite at first notice and it will help heal it in no time. If I do not have it and wait till later in the day, it will help me stop scratching it. I love it and love being itch free! !